In this article, readers will be able to follow steps on how to configure the UniFi Controller to accept payment for guest network usage. This article covers the UniFi side of the configuration exclusively, please see your chosen payment gateway's documentation for their specific configuration instructions. A payment gateway configuration allows for a guest portal that can accept payment for access to the network. Along with a variety of payment gateway providers, the UniFi Controller also allows custom "tiered packages" for the level of service. For more information on the settings within the Guest Control and Hotspot configuration sections, please see the UniFi User Guide (Chapter 3: Using the UniFi Controller Software, Settings > Guest Control). 1. Enable Guest Portal. Navigate to Settings >Guest Control and check the box to enable the guest portal. Under Authentication, select Hotspot. User Tip: In order to use PayPal, your UniFi Controller must be run on a fully qualified domain name (FQDN) with an active SSL certificate. 2. Enable payment-based authorization. Scroll down to the Hotspot section within Settings > Guest Control, and check the box for Enable payment-based authorization. 3.1 Under Payments > Payment Packages select the payment packages to be made available to customers. These may be edited, or you can create a new one by clicking Add Another Package. 3.2. 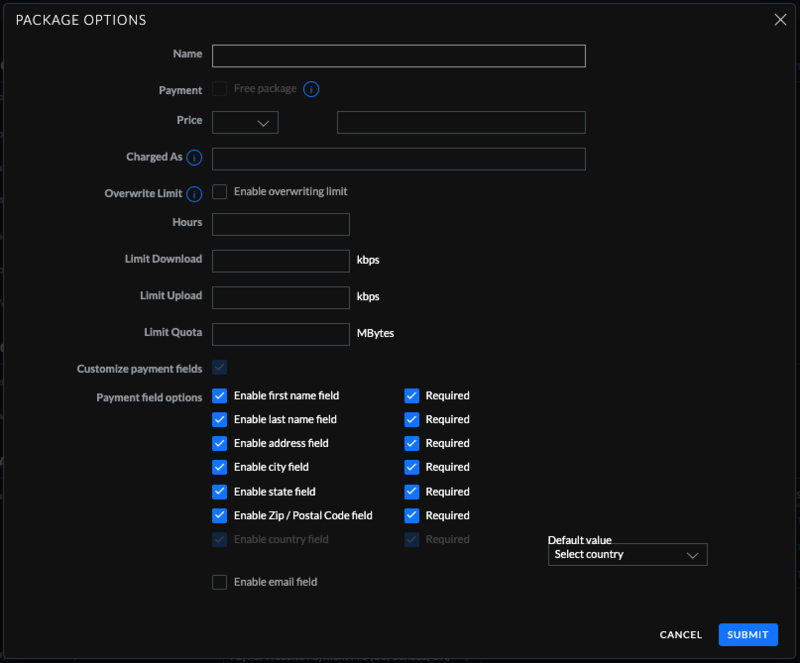 Under Payments > Payment Field Options select what information you wish to ask from users before they are able to access the network. These will be the fields of the form, and can be required or optional. NOTE: Certain fields may be required by some payment gateways; please check with your payment gateway for specific requirements. 4. Select the proper Payment Gateway. Each payment gateway asks for different data as per their system's requirements. Please contact your payment gateway provider to acquire this information if it has not been made available to you already. This section provides a list of external links to several payment gateway provider's information on how to obtain the necessary information to finish the configuration. Merchant Warrior - Documentation not found. IPpay - Documentation not found. For more information on how to obtain account details, please reach out to the corresponding provider's support team. Ubiquiti is not responsible for the support of 3rd party payment gateways. Use a client device to connect to the guest network and verify that you are able to connect to the guest portal and that the pay with credit card button directs you to a payment page.